At some point in the not so distant future, Crusader Kings II will have grown so large that it simply becomes our primary reality. That’s great if you’ve always wanted to kill a family member and grab their title, or manipulate the nobles of Europe into declaring a religious war on the Welsh. It’s not so great if you like cars, computers and not dying at 30, though. 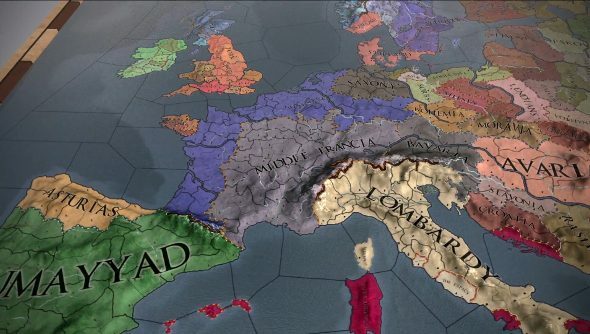 Today sees the grand strategy game get closer to that horrifying end point with the launch of the meaty Charlemagne expansion and the 2.2 patch. Charlemagne pushes the start date back to 769 AD, so would-be rulers can see the formation and rise of the pesky Holy Roman Empire, along with witnessing story events that surround Charlie himself. The expansion also introduces the Chronicle, a nifty in-game tome that charts the big events that affect a dynasty. The expansion can be picked up for £10.99/$14.99, but a lot of the changes that accompany it come in a free patch. You can take a gander at the long list of tweaks over here.